RMS vs. Peak Power Handling: What’s the Difference? If you had to make a list of all the components that are essential to any quality home theater system, the subwoofer would undoubtedly be right at the top. They’re a whole lot more than just another speaker – tasked with the dedicated reproduction of low-pitched audio frequencies and bass, they’re essentially what brings the entire system together. It’s the key ingredient that takes an assorted collection of speakers and other equipment and lets it gel together into a powerful, almost emotional experience. When you watch your favorite Hollywood film and the main character is running for his life from an explosion and it literally FEELS like it’s there with you in the room? That’s your powered subwoofer at work. When you’re listening to your favorite band and you close your eyes and can imagine that you’re on stage with them? You have your subwoofer to thank for that. A large part of success in this area comes down to a concept called power handling, which is something that efficient home theater subwoofers handle beautifully. However, as always, marketing teams around the world have only served to complicate things by introducing a number of terms that may sound great but in reality, don’t add up to much. If you really want to understand power handling as it relates to your home theater subwoofer, you’ll want to keep a few key things in mind. In terms of home theater subwoofers in particular, there are two main values that you’ll probably be faced with during your next purchase – RMS and “peak power.” Both are similar in concept, but when you really begin to break them down there are a number of important distinctions. RMS is an acronym that stands for “root mean square.” This number refers to how much power a particular subwoofer can handle on a continuous basis. Peak power, on the other hand, is exactly what its name suggests – the total amount of power a subwoofer can manage in short bursts for a limited period of time. Both numbers are important to know, as if you push your subwoofer beyond these levels you could end up accidentally damaging it. Think about it like this – because RMS measures the amount of power your subwoofer can handle without damage on an ongoing basis, it’s actually a lot more relevant to your current interests than peak power. This is true even though the RMS rating will likely be LOWER than that of peak power. If you’re talking in terms of straight performance, RMS is going to be reflective of the experience you’ll get the vast majority of the time. Peak power may give you the confidence to know that the short helicopter crash in the third act of your favorite movie is going to sound fantastic… but what about the other 98 minutes of screen time? RMS is going to tell you a lot about how THAT is going to sound, too. At the end of the day, both types of power handling are only telling you one small part of a much larger story. Some customers are often underwhelmed when looking at the technical specifications of a subwoofer, thinking that neither RMS or peak power values are very high. This is because you’re forgetting about the most important component of all: efficiency. There are a lot of factors that go into generating that sound you love and RMS and peak power handling are just two. Also hugely important is the sound pressure level (SPL). Sound pressure level is measured in decibels, and the larger number of decibels you’re working with the louder that speaker will sound. But again, it’s less about any ONE of these elements and more about how they all come together to form the finished product. All of this is a long way of saying that the next time you’re ready to upgrade your home theater system, you don’t necessarily need to pay as much attention to wattage as you might think you do. With RMS power handling, an efficient subwoofer can deliver an exceptionally strong bass performance – even if the wattage doesn’t seem to be very high at first glance. Remember that many manufacturers specifically exaggerate power and focus on peak power LEVELS for this reason – it looks great on a spec sheet, but it’s not a true representation of the overall type of performance you can expect from a subwoofer. So the next time someone tries to convince you that a subwoofer is great because of its “peak wattage” and nothing else, just remember those peak power settings don’t mean everything. When it comes to all that pulse-pounding bass that you’re trying to bring into the comfort of your own home, focus less on the numbers and more on the story the numbers are trying to tell you. Understand what things like RMS and peak power handling really mean and, more importantly, look at the overall efficiency of the unit in front of you. If you are looking for a truly efficient subwoofer with a small footprint in the home, check out Fluance’s newest 10-inch powered subwoofer the DB10. 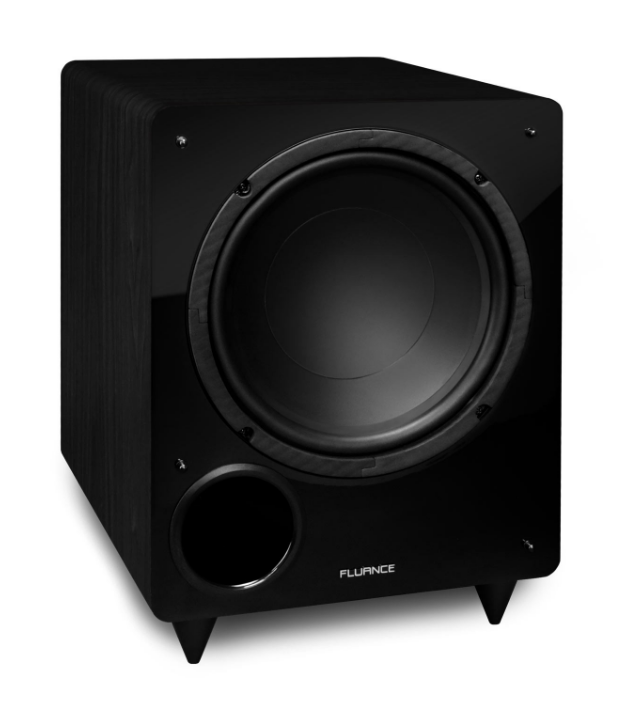 The Fluance DB10 Subwoofer offers cinematic, room shaking bass for a truly immersive experience bringing your movies and music to new depths. What Does Wow and Flutter Mean for Turntables? I agree to receive Fluance's newsletters.